Let’s continue the example I used while talking about transferring pictures with Picasa (Read Transfer your pictures with Picasa in 3 steps ). This time however, let’s see how we can quickly organize these pictures so that they will be easy to remember and find on my computer. Let me just recap quickly what this folder structure represents. The TRANSFER folder is the interim holding place of my digital pictures once I transfer them from my camera to my computer. I keep piling them up separated by the date when the pictures were taken. The FAMILY folder, which includes year folders, represents the final place for these folders of pictures. 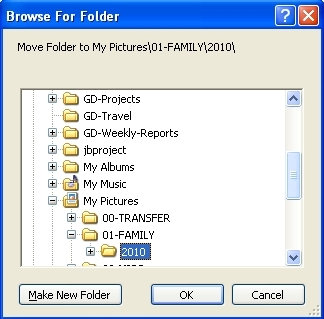 The difference between the FAMILY folder and TRANSFER folder is that each year folder under the FAMILY folder contains folders that have more details in the folder names. In fact they contain the date, the place and a short description of the event described by the picture in that folder. Bottom line is that the TRANSFER folder is a temporary, transitional place for my picture folders, while the FAMILY folder represents the final place where my picture folders will go. Now that your pictures have been transferred to your computer, it’s time to work on them a little bit and move them to their permanent place. The first thing I do, I open each folder and try to identify the event or events that are described in the pictures. Then I rename the folder using my super secret naming convention (Read Organize your pictures in five easy steps). Actually it’s just the date, the place and a short description. 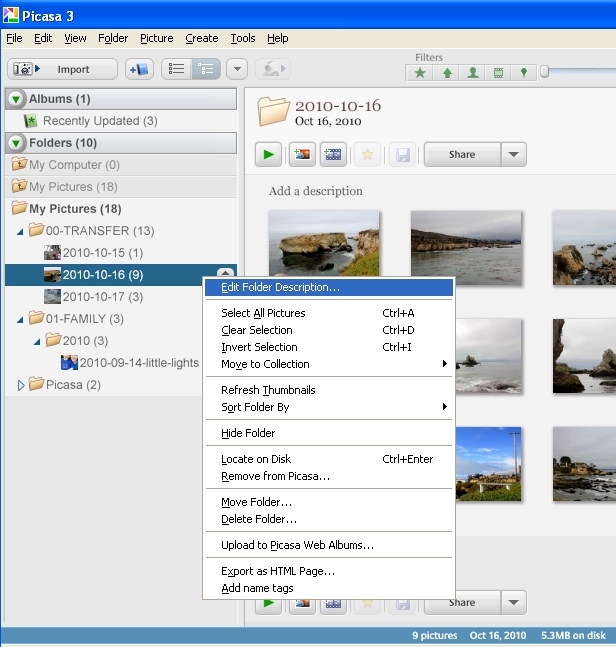 To rename a folder in Picasa just right-click on the folder and choose Edit Folder Description. 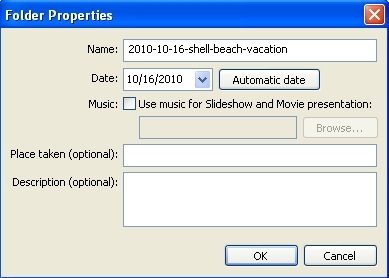 Just enter a new name in the Name field in the Folder Properties window. Secondly, sometimes I notice that some of my folders with pictures I just transferred have just a few pictures in them. In addition, especially when the event captured in a folder is a “continuous” event it is usually related to another folder. In my case the two folders at the park are related and I normally combine both of them into one folder. Moving pictures from one folder to the other is very easy in Picasa. Just select the pictures by holding the CTRL key and clicking on the pictures you want to move, and just drag them in the new folder. Thirdly I clean up the pictures a little bit. So, I open for example the folder 2010-12-01 and notice a few pictures out of focus and some in really bad light. So I delete those. In addition I also do some batch processing if there are some effects that can be applied to many pictures. The most common one I use is “Red-Eye Reduction”. I usually apply it in batch when I have a bunch of pictures taken using the flash inside the house. Now I do some tagging. At this stage I do mainly general tags like place. So I select all the pictures and apply tags, preferably tags that I have already used before. 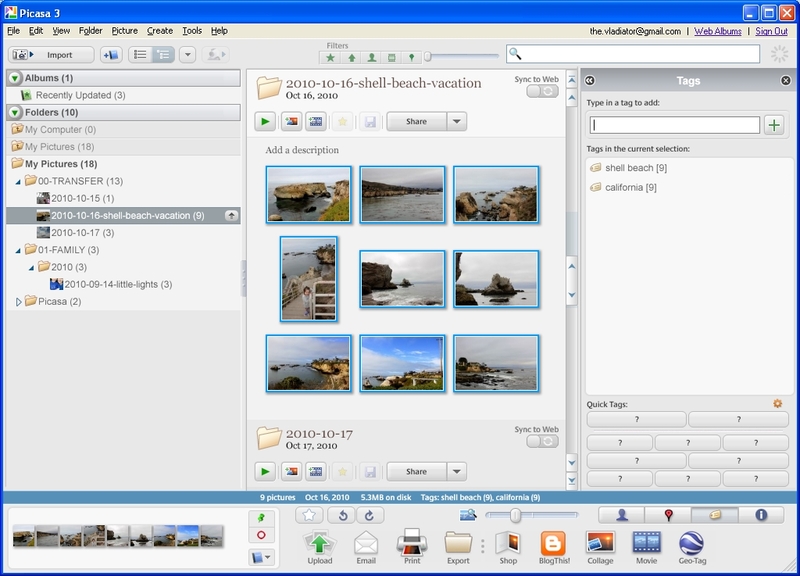 Tagging pictures with Picasa is as simple as selecting the pictures and typing your tags. This step is very straightforward. Now that the folders have been renamed and cleaned up they are ready to be moved to their final location. So, just move them using Picasa. 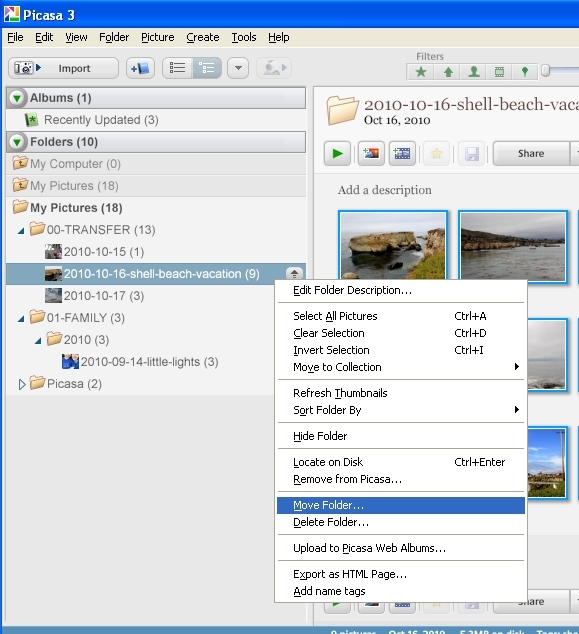 Moving a folder with Picasa is very simple. Just right click on the folder and choose Move Folder. Then choose the target folder where you want this folder to be moved. I downloaded your e-book and read your website information on photo organization in Picasa. The approach is very useful to me, if only in that it has probably made me turn the corner and make a decision as to how I would like my folders set up. ? You have also encouraged me to go back once again to Picasa, this time to conquer rather than discard it. The task of conversion is not trivial, of course, but your book is a help. A retired academic physician, I am 85 and have been into photography in a serious (amateur) way for more than 60 years. I have a cupboard-full of cameras and related gear to prove it. I also am not a newcomer to computing, having written my first code somewhere in the late 60s – Fortran – and moved on through dBase, Clipper and C++. So much for the biography. I have two main questions for you. 1. In terms of organizing photos with an eye on posterity, what is your best guess as to the way in which ones choice of the way to do this might be influenced by the trend to mobile devices, away from the desktop, and towards cloud storage etc? I am anxious to do something that will be of use to my family twenty years and more from now. 2. I have a large number of images with metadata inserted using ACDSee Pro, which I like for editing. How do I access the tags and keywords with Picasa? By way of a suggestion, I have had difficulty answering the question “What is Picasa and how does it work?” It might be useful to answer that in the first page of your e-book, as it is very different from most (all?) of the other photo-organizing software out there, which is largely geared to editing. Regards, and thank you for your assistance in helping me get my head on straight. Barrie…Thank you for the very insightful questions. I have replied to you via email. Here in the comments I will only say that ACDSee Pro should be writing keyword information to the IPTC metadata fields which Picasa is reading (and also writing to). So you shouldn’t need to do anything to preserve your keywords. However, let me know if you have entered other metadata with ACDSee Pro which doesn’t show up in Picasa…I would be interested to know.